Weight :8kg ,size appr 230x200x300mm , so easy to ship, easy to mount , 4 units fit in1 19"Chassis or stand alone.. 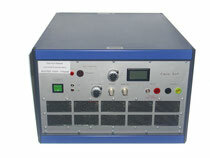 Application:CO2Laser, HVCharging , HV for any purpose. The linear 1000V -1A Amplifier type needs semiconductors ,able to change the resistance to operate from 0 to 1000V under the full level of output-current , : so 1000V with 1A means a lot of (pulsed ) power (UxI), so this power has to get absorbed by ..heatsinks and fans , even with relatively low currents. The advantage of the linear 1000V Piezo Amplifier is a good low noise behaviour , also bandwith and phaselag can get adapted to smaller piezos. 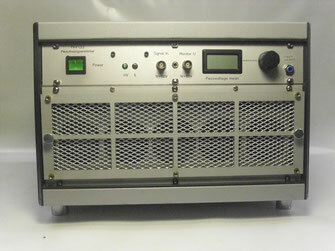 The Recharging 1000V 7A Amplifier works in switched mode , this means much less powerloss (appr. n=10..20%). but 7 times bigger in current (linear Amplifiers 1A 1000V; recharging Amplifier 7A 1000V). 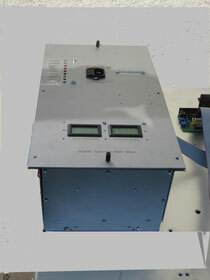 Piezo Driver for high power demands , optional with 1050+ and 200V- , or +/-500V. Bandwith >1kHz .Charge Recovery : I-line consumption < 3A at full load. Line voltage 240VAC , or 110VAC. 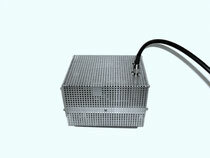 Adaption to the application is necessary and possible to reduce noise and power if needed. For lower currents and voltages <1000V a linear piezo amplifier is a good choice to drive piezos. New: 22kHz600Vpp in 50nF ! good reliability , low noise, good thermal behaviour. Bandwith 200V-5A type : 4uF 1700Hz , 2uF >3kHz. 200V, 500V , 1000V and 20A......400A loading and discharging , or only loading with nominal current and discharging with much lower current , pulse width limited (1usec ......Xmsec.) . This generator drives plasma-reactors /biochemical, atmospheric .. It works from 48V , the transformer at the right side, can get placed very near to the reactor, so the safety requirements are reduced to the transformer /reactor .No matchbox required , no cable problems , with a shielded reactor: no EMC problems. Option :Open frame version, lower cost . This module drives a stable voltage into a glow discharge with an ignition voltage under 1200V. current- controlled .It works with 240V and 110V AC. 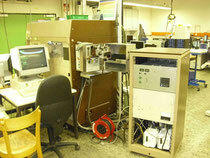 Application :spectral analysis of the glow discharge zone on the surface of conductive material. This picture shows a glow discharge spectrum analyser (Swiss Product , 1980) , updated with SG1200, it replaces the old fashioned (but good) tube generator to assure future functionality to save this reliable equipment. PIEZOMECHANIK(GE) and other projects in combination with Piezos:BMW,EADS,BOSCH,CERAMTEC,FH-LBF,FH-ISYS.